The Chicago Bulls paid tribute Saturday night to all military members in honor of the upcoming Veterans Day. 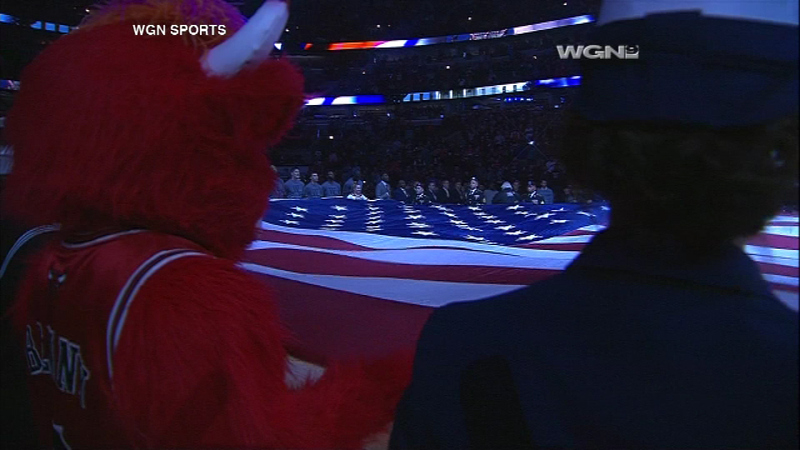 CHICAGO (WLS) -- The Chicago Bulls paid tribute Saturday night to all military members in honor of the upcoming Veterans Day. More than 100 veterans and active service members were special guests of the team and were honored during a special performance of the singing of the national anthem. The Luv-a-Bulls also put on a special performance during halftime. Earlier, the Bulls welcomed service members to a scrimmage as part of the team's "Hoops For Troops" initiative.